When my son was born six and half years ago, I knew without a doubt that I would do absolutely everything I could to breastfeed successfully for as long as I could. The trouble was, I really didn't know anyone that breastfed at the time. My family was supportive in my decision, but if ever I were to run into issues or have questions, I had no one to turn to. Thankfully, breastfeeding my son got off to a pretty easy start...he took right to it, no latch issues, no food sensitivities...aside from the initial painful days as my body adjusted, we really had no problems until my son was six months old when I developed mastitis. Thankfully by that point, I had done my research and was able to push through it without giving up. In the end, my son was able to successfully breastfeed for over three and a half years. The reality is, breastfeeding can be tough. Even after having breastfed my son for so long, breastfeeding my daughter was a completely new and different experience. She took to it easily just as her brother did, but after my milk came in the engorgement was so bad, she couldn't latch properly, which led to cracks and pain and tears all around. It was TOUGH. But I had the experience and the knowledge that it would get better so I pushed right on through. Had this been my experience with my first child, would I have? I'd like to think so, but honestly, I couldn't say for sure. Unfortunately, it seems the knowledge and support for breastfeeding moms is severely lacking. Too many times, I hear of moms who gave up breastfeeding sooner than they wanted because they didn't know any better. They may have been given bad advice by friends, or even doctors. They didn't know the issues they were experiencing were normal and would pass...or that there were easy fixes that would have allowed them to continue on. I personally try to offer my advice and support to any new mom who asks, but I am only one person. Wouldn't it be great if there was a service out there that offered support and encouragement for all stages of the breastfeeding relationship? Something fun that moms could look forward to and learn from? Well, now there IS with 16 Minute Club. 16 Minute Club is a wonderful new monthly subscription box service designed just for the nursing mom by a certified lactation consultant. I often refer to our time breastfeeding as a journey, because it truly is that- it grows and changes each and every day. Any mom who has breastfed a little one for any extended period of time can tell you that breastfeeding a newborn is a completely different experience than breastfeeding a one year old...and every age in between. Each month's box is personalized with this in mind, and tailored to your baby's developmental needs. Green Sprouts Snip & Go Scissors: Perfect for making bite size pieces for your little one, with a special tip for mashing! Green Sprouts Easy-to-go Feeding Disposable 4-piece set. Includes bib, spoon, wipe and feeding product guide. This is perfect for tossing in the diaper bag when you're out and about. NumNum Dips- These are probably my favorite product included. They make it easier for baby to learn to self feed...and soothes sore gums from teething too. My daughter LOVES these, so we'll be buying even more in the future! Breast Practices- a newsletter offering advice and support for each baby's age. This one was of course all about starting solids. This contained a lot of great information to help in the transition. One of the things I loved about this particular box was that it was all great for feeding on the go. As breastfeeding moms, feeding on the go tends to be easy- there's no prep work involved- your baby's food is always readily available...nothing to pack (aside from perhaps a cover), so I know at least for me personally, getting into the habit of preparing food for a trip is certainly a transition, so these products make it a little easier! But this is just one of the boxes available. Each one it different and designed with baby's age and breastfeeding concerns appropriate for that age in mind. In those early days, you wonder about getting a good latch, and engorgement, and establishing a good supply. When baby starts teething, you worry about biting and how to prevent/stop it. As the one year mark approaches, you *may* be considering starting the weaning process...or not! (Though this is only a 12 month service and the final box does discuss weaning options, they emphasize weaning when the time is right for mom and baby-even beyond this first year!) Whatever the stage you are in, 16 Minute Club has the perfect box for you, and each month you can have it delivered right to your door. One of the things I really like about this particular subscription box service, is that your subscription is completely flexible. Perhaps you're expecting and want to buy ahead for the first year, you can do that. Perhaps your baby is already six months old, and you want to start with box six and continue throughout the first year, you can do that too. Or maybe you just want to buy one box at a time...you can even do that! You can start your subscription at whatever stage your little one is currently in, and continue it for as long as you'd like. Overall, I really loved my 16 Minute Club box and think this is an amazing service for any breastfeeding mom. Whether you are breastfeeding yourself, or know a new mom/mom-to-be that could use some support along the way, this subscription service is a must see! And be sure to come back next week (March 11) to learn more about Box 6 and for your chance to win a box of your choice in the Mix It Up in March Giveaway Event!! Disclosure: I received the box mentioned above in exchange for my honest review. All thoughts and opinions are 100% my own. 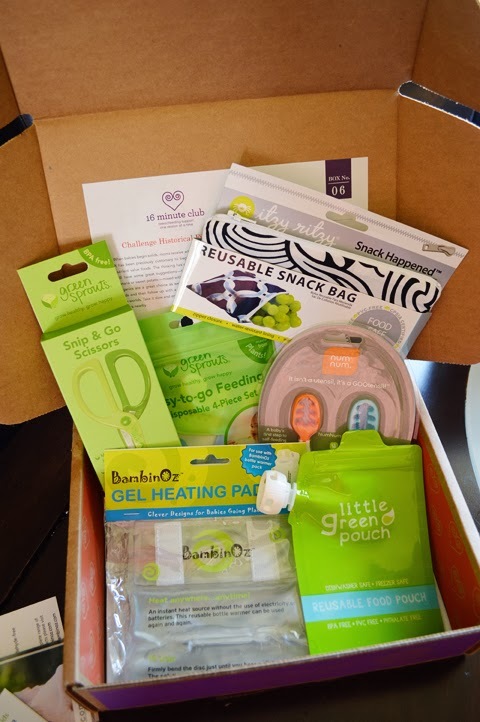 I love subscription boxes and this one is awesome since it tailors to breastfeeding! I BF both of my children and plan to do it with the third coming soon. I will def sign up for this!